Clamping device and tool all in one. With the SPANNTOP m-ka you can clamp and machine simultaneously. This chuck shows its true talents when used on a sub pindle with z-axis and x-axis. It is rigid, accurate and indestructible, just what you would expect from our SPANNTOP chucks. Full passage, when used for bar feed applications on the main spindle. 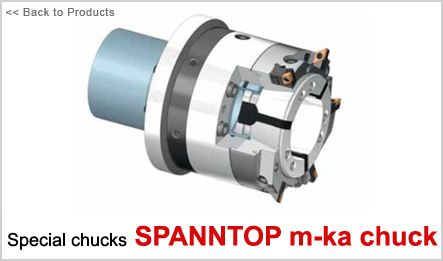 What’s special about the SPANNTOP m-ka chuck? The radially arranged cutting plates that can be used to machine work pieces clamped in the sub spindle, as desired. For example: through turning or »fl y-cutting« a multisurface profi le. And when you’re done machining on the main spindle, the chuck picks up the work piece and you can fi nish machining the 2nd side on the sub spindle.